Attack the walls, build siege weapons, explore the dungeons, and prepare your strategy on the fast-paced card game Castlecards. Destroy the enemy castles to win the game! Each player starts with a castle card, protected by three wall cards. A castle can't be attacked until you destroy its walls (unless you get an assault card). 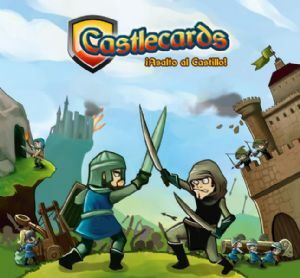 The defense value of the castle and walls is represented by shields; to destroy a card, you need to attack with more swords than shields. You can attack with several cards, gathering soldiers, bowmen, siege weapons, etc. Your enemy can avoid your attack using academy cards (strategies to reduce the damage taken). The Town deck provides soldiers, bowmen, builders, explorers, gold and more. You will draw 1 Town card on each turn, and you will perform an action then (an action can be played with 1 or more cards at the same time). The Siege deck provides siege weapons with high attack power; you can get Siege cards using your builders and gold. The Academy deck provides tactics to avoid enemy attacks. The Dungeon deck will be open with explorers; beat a deck to get a treasure (additional town cards).